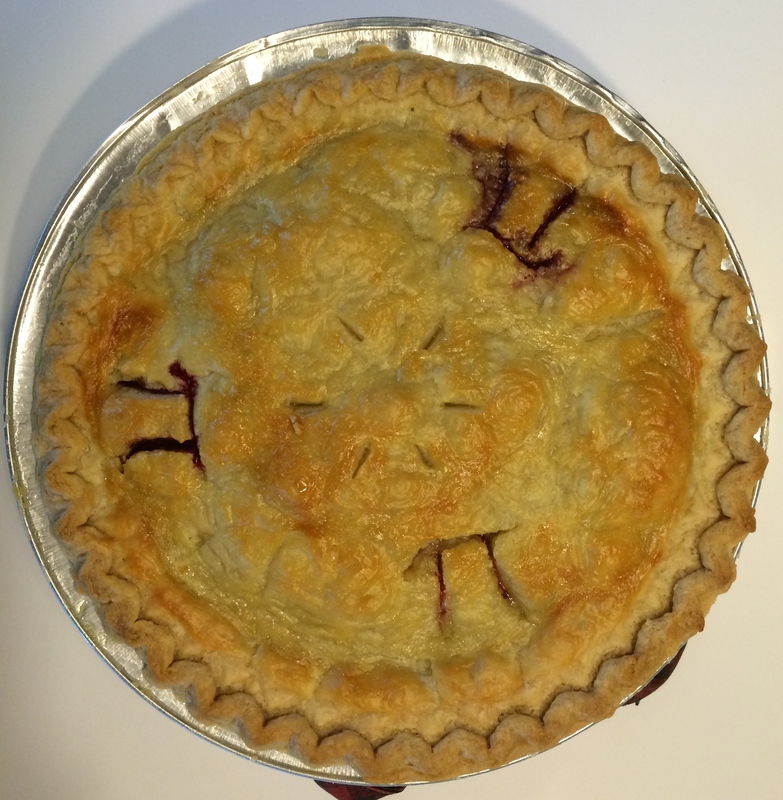 2015 had a very special Pi day. In a normal year, Pi day is March 14, or 3.14; pi accurate to two digits after the decimal point. 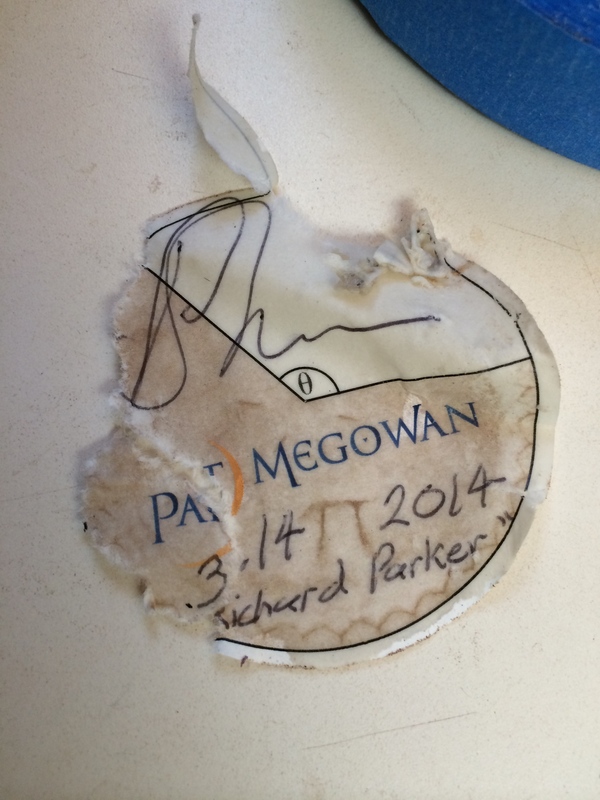 This year, it was 3.1415 (March 14, 2015), good for four digits after the decimal. However, if you append the time 9:27 you’ve got 7 digits, and if you are willing to venture into the sub-second realm you can have pi to as many digits as you like–though you’ll have to celebrate fast. It seemed obvious that this special event called not only for a distinctive instrument, but for a special instrument label as well, which of course required research, which involved making and eating pie–excellent! Berry pies gave good contrast, that decision was easy, but it wasn’t easy getting the right size of pi symbol along with a nice ripple to the edge, attractive browning, and not too much overflow of filling. 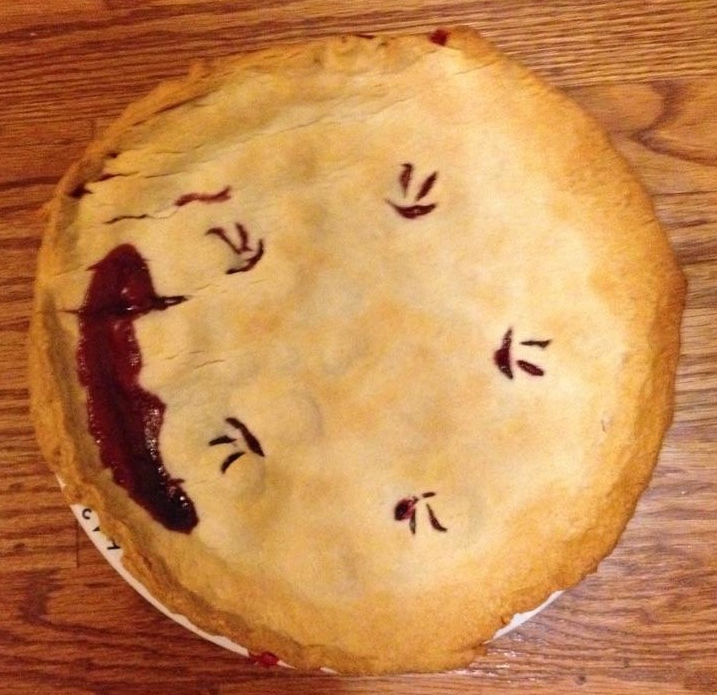 This next pie yielded the photo for the label, but just a couple minutes later the pi symbols were overflowing and the pie was good only for…eating. How sad. Graphic designer Julie Weiss and I blended the photo with a trigonometry “unit circle” and my logo to create the label. It took many iterations to balance the photo, unit circle, and logo just right, and a few trips to the printer to get it onto a suitable paper. Finally we had the right label. 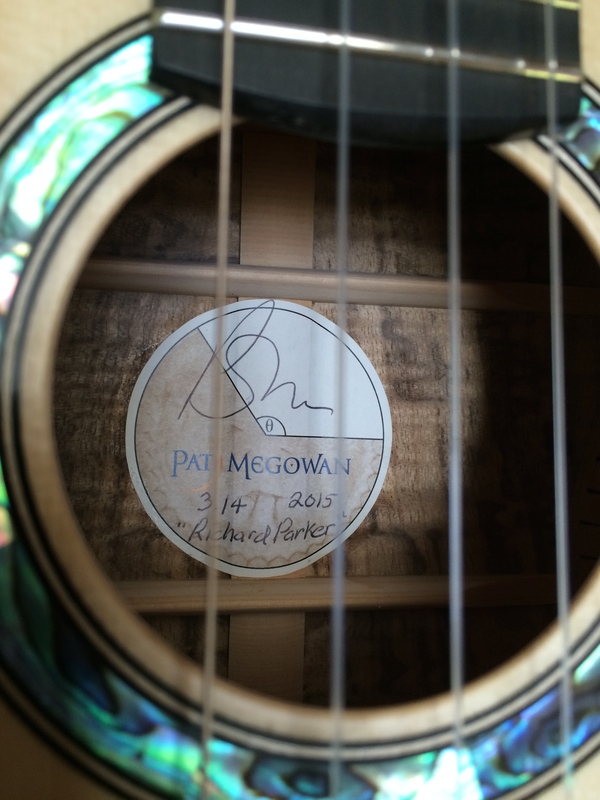 After signing and dating it, applying glue, gingerly slipping it through the soundhole and pressing it into place, I leaned back to admire the work only to notice a little problem–the wrong year. Sinking feeling, possibly some choice commentary. If only I’d had the label back on Pi day just before I closed up the body, when labels are commonly (though not always) installed. At least I’ve got the labels for future years. Indeed. Richard Parker is the curiously named tiger who floats across the Pacific on a makeshift raft with Pi in the Life of Pi. The back and sides for this instrument are commonly called tiger myrtle, and this tree made one heck of a tiger! But there’s more. When I started building instruments, my physicist sister Colleen lobbied me to name my vast enterprise “Pi Ukuleles” or “Pi Stringed Instruments”, and put the Greek symbol for pi on the headstock. After all, it is the Greek rendering of the first letter of my name, I was a math major in college and remain something of a geek, and it’s just cool. AND I like pie, seeking out pie places up and down the Sierra Nevada mountains of California, which by the way has remarkable pie in some highly scenic places; pear-cheddar at 10,000 feet at the Rock Creek Lake lodge, anyone? Yum! It all seemed obvious and settled to Colleen, but I decided to use my own name and the crescent moon for even more compelling reasons, if that can be imagined. However, the idea of building a special instrument each year to celebrate Pi day–March 14 (i.e. 3.14)–was too good to pass up. Top: bearclaw Swiss alpine spruce, with Paua abalone rosette. tuning: currently strung with low G Worths, easily converted to re-entrant. 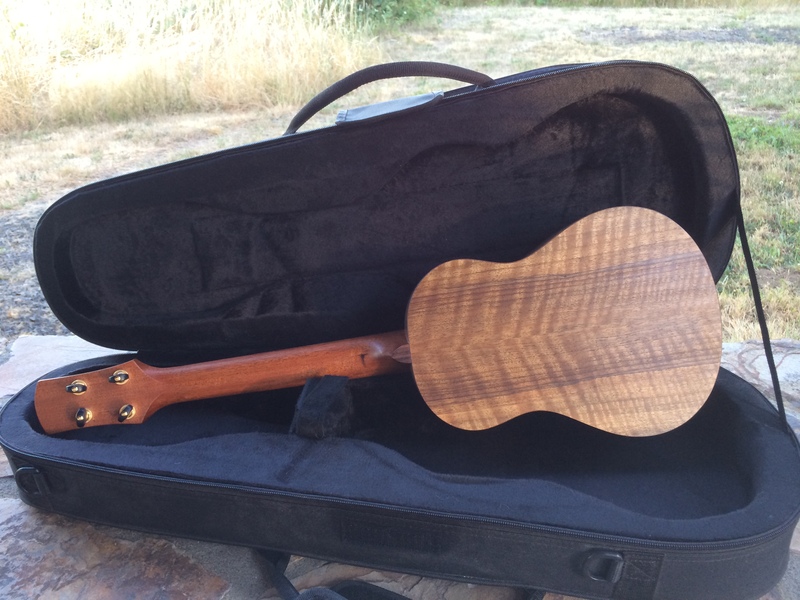 RP has some serious go power, and will travel with us to Uke U-4 in a few weeks–Exciting!! Come and say hello if you can. For many years I wasn’t much for naming instruments; they were “the Les Paul”, “the mandolin”, and so forth. Then in my 40s Cecilia came about as a way to describe the desired voice of a mandolin that Steve Gilchrist was building for me; Cecilia Bartoli is a golden-voiced mezzo soprano who sings with gorgeous warmth, verve, and line. I later heard that Steve listens exclusively to bluegrass and probably didn’t know Bartoli from Madonna, but he built a spectacular instrument so it all worked out. Now, with multiple instruments in process at once, I often name them as an amiable way to think about and discuss them with others. Watson got his name by having English walnut back and sides and a big heart. Top: Carpathian spruce. Lynn Dudenbostel describes it this way: like great Adirondack without a decades long break-in time! It’s hard to capture in a photo, but the Carpathian top has striking silking, a term used to describe the lustrous appearance of the ray cells that cross the growth rings. Their prominence is an indication of well quarter-sawn wood. 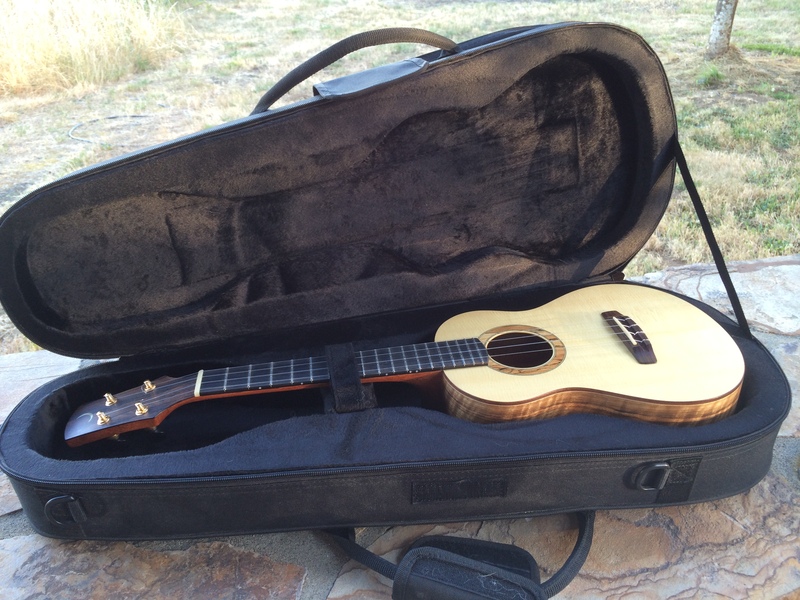 Watson has lived in a loving home, but his owner dreams of an orculele, so he is available on consignment and will be available to audition at Uke U-4 in Bend, or by contacting me to arrange a visit. 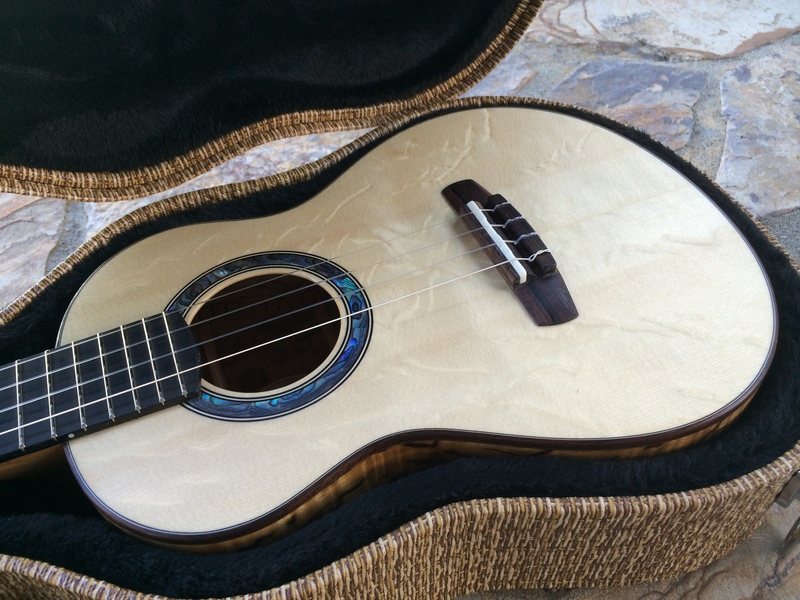 Uke U-4–The 4th Annual Ukulele University! 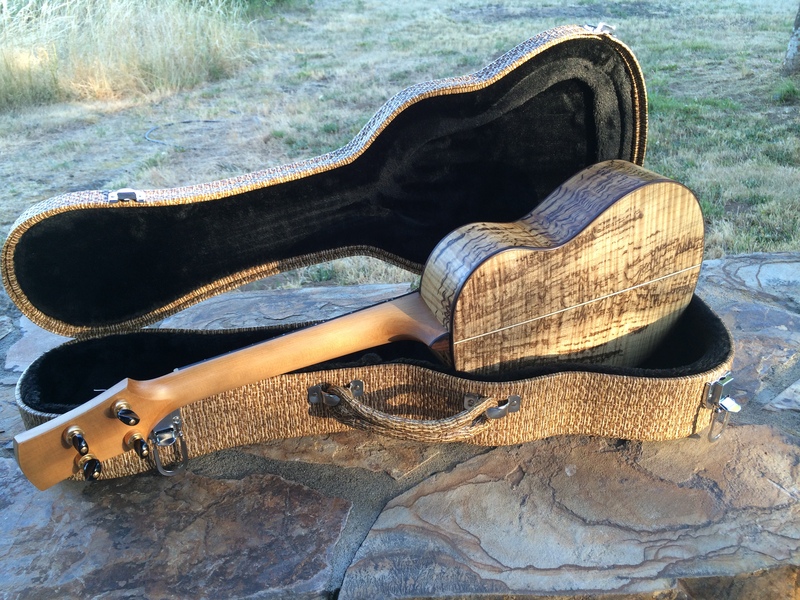 It will soon be all things ukulele in Bend, Oregon when Uke U-4 raises the roof from July 17 through 19–just a few weeks away. They have a great lineup of performers and instructors, including Sarah Maisel and Craig Chee (who just completed a new recording), Aaron and Nicole Keim (The Quiet American), Ben Bonham and Ronnie Ontiveros, Pipa Piñon, Jeff Stevens, Rhan Wilson, Rick Zeek, Cinda Johnson, and hula/uke/Hawaiian culture instructor Kumu Iwalani. I’ll be there (with daughter and new ukulele convert Meghan) with two instruments–Richard Parker, and Watson. Further introductions in following posts. Aloha to friends of yore and those about-to-be, see you soon!